Ultimate Arcade Inc. filed a trademark application for the word "Flappy" last month and is already sending out notices of infringement to app developers. Update: A law firm representing Ultimate Arcade Inc. has responded to our inquiries, explaining that the company does in fact have a legitimate claim to the "Flappy" trademark based on its 2006 game of the same name, which is available online and for Android devices. "If we do not police the marketplace to stop the use of confusingly similar trademarks, UAI stands to lose all of its valuable goodwill associated with its long use and advertising of the 'Flappy' mark," Lundeen & Lundeen, PLLC, explained. "UAI is not complaining about the play or style of the 'Flappy' clones; so far the game code or characters do not appear to have been copied by anyone that we are aware of -- we are only asking developers to respect our trademark rights and remove 'Flappy' and any confusingly similar terms or marks from the names, metadata, keywords and game descriptions to stop the confusion." "In the U.S., trademark rights are acquired by use OR registration. 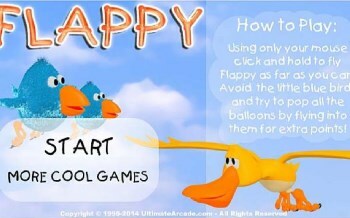 UAI has had more than 8 years of use of the 'Flappy' mark for computer games, 7 years exclusively before the Flappy Bird game by Dong Nguyen and the explosion of other confusingly similar and/or deliberate knock-offs," it continued. "Our application to federally register the mark 'Flappy' was only recently filed when we became aware of the widespread confusion, and may take a year or more to register. During the registration process, third parties who object to the registration will have an opportunity to oppose the registration. None of the other 'Flappy' applicants are claiming earlier use than UAI, which will determine who is entitled to the registration." Because holding a federal registration is not required in order to combat trademark infringement, UAI intends to "fully pursue and enforce its common law rights" to the term. Thus, the claim it filed with Apple, which has begun issuing notifications to infringing app makers, most of whom have been "respectful" of UAI's mark and have voluntarily removed the infringing content. Lundeen & Lundeen also noted that UAI hasn't attempted to make money off of this or tried to force infringing games off the market. "We have not demanded that any of the clones pay us damages, take a license or stop distributing their games (with appropriate re-branding to avoid palming off on the good will of UAI's 'Flappy' trademark)," it stated. "UAI is not in any sense a 'trademark troll'." In hindsight, it makes sense: In the wake of the flap over Flappy Bird, a company called Ultimate Arcade Inc. has laid claim to a trademark on the word "flappy," and is firing out trademark infringement notices to developers of games "inspired" by the surprise hit mobile game. The notice claims that UAI has used the mark since at least February 12, 2006, and that it has licensed the title numerous times over the years to companies including Big Fish Games, which hosts on its site a game entitled Flappy. It sounds at first blush like a fairly straightforward case of trademark trolling, especially since Ultimate Arcade Inc. only filed for a U.S. federal trademark on February 16, not long after the creator of Flappy Bird removed it from distribution. And while it's hardly the only company trying to grab a slice of the pie - no fewer than eight game-related "flappy" trademark applications have been filed by different companies over the past few weeks - Ultimate Arcade appears to be the only one actively trying to put muscle behind it. But in an unexpected twist, it looks like UAI might actually have some basis for its claim, as Big Fish Games confirmed that it did in fact license the "Flappy" trademark. "We signed a distribution agreement with Ultimate Arcade Entertainment about 5 years ago," a Big Fish spokesperson said. "UAE owns the game, and we have licensed it." That obviously supports Ultimate Arcade's claim on the mark, but why is it that the trademark filing itself is less than a month old? The application indicates first use of "at least as early as 02/12/2006," and also includes screens of the Flappy game hosted by Big Fish, but there's no indication that the company actually held the trademark in the past. It seems clear that the filing is driven by a desire to capitalize on the Flappy Bird phenomenon, but it also appears that there might be more going on here than first meets the eye.